In honor of Black History Month, the Milledgeville Convention and Visitor&apos;s Bureau will be offering a free African-American historic Trolley tour on Sunday, February 12th and 26th from 2:00 p.m.-4:00 p.m. The tour will highlight the African-American heritage of Milledgeville where religion flourished, education grew and influential men and women left their mark on the Antebellum Capital. Hear about Wilkes Flagg, a leader in the black community who purchased his own freedom and organized Flagg Chapel Baptist Church and served as the pastor for 28 years. Visit the Sallie Ellis Davis home which was opened to house student boarders who would have otherwise not have been able to attend school because they lived long distances from town. Learn about the center of African-American commerce known as "the strip," an area in the block of McIntosh Street between Wilkinson and Wayne Street. Among its businesses were a shoe repair shop, a barbershop, a drugstore and restaurants. The Strip was part of the African-American social life as well. 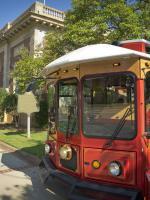 The trolley tour will leave from the Convention & Visitor&apos;s Bureau office at 200 West Hancock Street (across from the old Courthouse) and is first come-first served. Linda Bailey at the Milledgeville CVB encourages everyone to take advantage of this wonderful opportunity to tour the Antebellum Capitol and learn more about the heritage that molded Milledgeville into the rare treasure it is today. For more information, please contact the CVB at 478-452-4687 or visit their website at www.milledgevillecvb.com.